There are just some groups of people that I simply LOVE to be around. College ministry leaders are at the top of that list! When a room is filled with individuals who believe the college campus is one of the most strategic mission opportunities we have as the church, you’ll find a room full of vision, passion, and a whole lot of fun! If you are a collegiate minister, a collegiate church planter, or a volunteer in a collegiate ministry, you will not want to miss the Collegiate Summit conference in Hendersonville, TN (just outside of our great city of Nashville) on May 2-4, 2018. I know, that’s a year away – but if you put it on your calendar, you can start making plans to join the hundreds of collegiate leaders for a time of challenge, equipping, and encouragement. Since the Collegiate Summit only happens every three years, you won’t want to miss it! In the years that I was a college minister in Kentucky, I counted the days until the next Collegiate Summit. I knew that for those three days, I would be around people that truly “got” what I did and that I could learn from great leaders from all around the country. There was never a question for me if I was going to attend the Collegiate Summit – it was a given that I would be spending those days with my collegiate ministry family. Planning is underway for the details of the Summit, but you can already count on great main stage speakers like Ben Stuart, Tom Richter, and Russell Moore, along with breakout sessions that will address some of the key issues collegiate ministry faces in today’s culture. There will be opportunities for you to connect with others who are leading or volunteering in ministries similar to yours. You’ll meet people from all over the country (and the world) that have a heart for seeing college students come to know Jesus, walk close to Jesus, and be mobilized for the cause of the Gospel of Jesus. 1. There are always things to learn. The college campus is at the front of culture changing. It’s important to hear from others that are doing ministry in similar contexts. Be a lifelong learner. The Collegiate Summit will give you an opportunity to hear from some great minds and find out about some new resources for your ministry. 2. You’ll really like the people you’ll meet there. There is just something special about being around people with a similar heart and calling in ministry. The Collegiate Summit will give you the chance to meet new friends that are just as passionate as you are about ministry with college students. If you come with a team, branch out while you are at the Summit and meet some new folks! 3. It will be super encouraging. We recognize that collegiate ministry is difficult. And let’s face it, not a lot of people really understand what you do. The Collegiate Summit will be a time for you to worship, reflect, and take a deep breath. We’re thankful the opportunity to pour into your life for a few days as a thank you for the investment you make into the lives of so many college students. 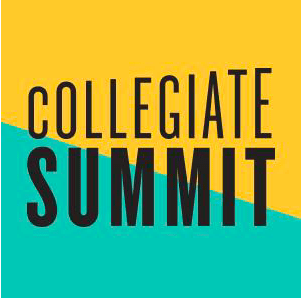 Go ahead and check out http://www.lifeway.com/Event/collegiate-summit-2018-nashville-tn to register yourself and your team to be with us May 2-4, 2018 for the Collegiate Summit! I can’t wait to see you! Maybe we can even meet up for some of our fine Tennessee BBQ.